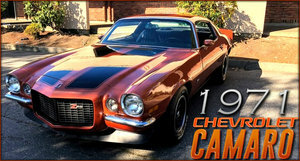 This is a rare opportunity to purchase a true piece of automotive history. 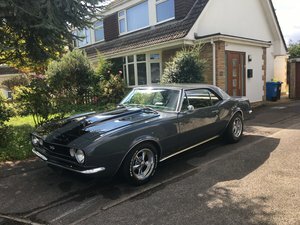 For sale, our beautiful fully restored, numbers matching, 1968 Chevrolet Camaro RS / SS with original L48 350ci 295hp engine, connected to original Muncie (M21) 4 speed transmission and 12 bolt rear end, This is a true SS car. The car was imported into the UK in 2016, by a company in Essex, where the car sat until April 2017 when we purchased it. The only work carried out on the car in the UK up until this point was a rebuild of the 350ci engine in March 2017. The car benefits from power steering, front disc brakes, tich toch tach & clock, centre console & gauge pack, wood grain instrument panel, rare SS steering wheel & very rare fibre optic system. Over the last year the car has been stripped down to a shell and extensive repairs to the floors, foot wells and rockers completed. The car has also received a complete respray of its original British Green paintwork (a one year only paint colour offered on the Camaro & Corvette). The car has been returned to as close to factory spec as possible including Rochester 4 barrel carburettor and correct SS 350 air cleaner. The car has also been treated to new Firestone Wide Oval Radial Redline FR70 X 14 tyres over body coloured steel wheels with dog dish hub caps. VIN: 124378N443468 Cowl Tag ST 05E TR 68 12437 NOR 142764 BODY 721 Z2 PAINT The Cowl Tag reflects the following- produced the last week of May (05E) at Norwood, British Green paint (Z), Black Vinyl top (2), Gold Deluxe Bucket Seats (721). Firewall stamp: 8N443468 Engine stamp: 18N443468 V0521MS Transmission stamp: 18N443468 P8E16 Factory options on this car Front and rear bumper guards Rare SS steering wheel Centre console and gauge pack Z87 – custom interior which includes bucket seats, moulded arm rests, deluxe steering wheel, wood grain instrument panel, tick, tock, tach. U46 - fibre-optic system, very advanced for the day, that was used to monitor headlight and turn signal function, letting the driver see that the headlights and all 4 turn signals were working correctly. These are identified by the little silver reversed scoops on the front fenders and a little black box on the rear package tray. 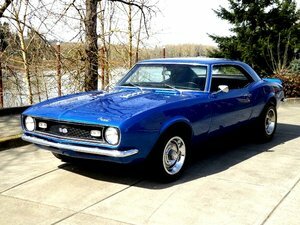 Only 155 Camaro's fitted with this option in 1968. ZJ9 – auxiliary lighting package that added lights to either the foot wells, glove box, ash tray, or all three. This Camaro has lighting to the foot wells and glove box. We have a photo diary of all the work carried out on the car over the last year and invoices for all parts purchased and full details of the engine rebuild which will be included in the sale. New MOT dated 31 July 2018. 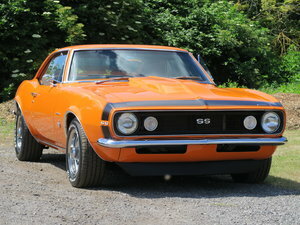 Mileage: 90727 If you would like to see more about the car please follow these links: https://goldingbarngarage.com/portfolio-item/1968-chevy-camaro/ https://www.facebook.com/goldingbarngarage/videos/305621123359316/ NO PX. Payment to be made by BACS / Electronic transfer. The car is advertised elsewhere and we reserve the right to end this listing at any time. If you have any enquiries please drop us a mail.